Following a difficult loss in Turin on Wednesday during the Europa League Cup final (Sevilla 0-0 Benfica 4-2 PK), today Benfica had a chance to enter into Portuguese footballing history by being the first team ever to win the domestic treable, if they won the Portuguese Cup. 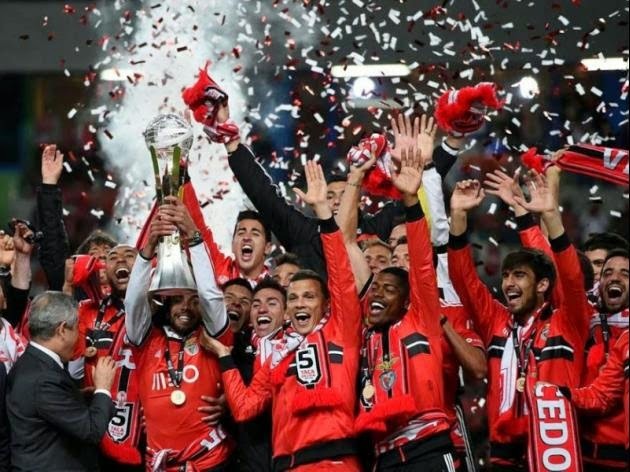 History was made, Benfica won the Portuguese Cup 1-0 against Rio Ave and has added the club's name to the history books by having won the domestic treble for the first time in the Country's footballing history. Benfica was coming into this final knowing that a victory would not only put their names in the history books but also the cherry on top of what was almost a perfect season. Benfica started the game with ball possession and controlling the movements of the ball in their offensive half, Enzo Perez and Ruben Amorin were given the role of controlling the ball in the middle of the field and not only recuperate the lost balls but also send quality passes to the attacking duo of Lima and Rodrigo. Benfica didn't looked fresh physically and the team was not showing attacking dynamics seen in previous matches but ball control and defensive awareness was keeping Benfica on top of the game and able to create chances of scoring, most of them created by Salvio on the right side of midfield. He had missed the Europa League Final on Wednesday due to yellow cards, so it was obvious that his freshness could be a way to open up the very defensive minded Rio Ave that seemed to be more worried about defending than attacking. At the 20th minute the moment of the game, after a pass from Enzo Perez, Nico Gaitan on his weaker foot takes a shot from outside the box and puts Benfica in the lead 1-0. Benfica continued to control the game and pushing Rio Ave into their defensive half of the field. Oblak was almost a spectator for the first 45 minutes of the game. Benfica had not played well, created 1 chance to score and had made it count, and like that reached halftime with a 1-0 lead, that was fair not as much for what Benfica had done but for the lack of attacking football that Rio Ave had shown. Rio Ave came in changed, the players on the field were the same but the attitude shown and tactic balance on the field was very different. The defensive lines were defending more up the field, Tarantini was not defending more in the Benfica defensive half and not on his own half. These tactical changes by Rio Ave and the obvious physical tiredness of the Benfica players were two factors that changed the footballing dynamic of the second half. Rio Ave looked very dangerous and created numerous chances of leveling the score line. The best chance came from Pedro Santos that from a wonderful cross into the box he took a shot that was only stopped by the post. It was obvious that if Benfica was to win this game Oblak would have to stand on his head and keep Rio Ave from leveling. Oblak started to show everyone how important it is to have a keeper of his quality, he was able to keep his team in the game for the better part of the second half. Looking at a Rio Ave team that was pushing forward and gaining second balls it looked like players like Gaitan, Salvio and now Markovic (subbed in 66m for Rodrigo) could use the space behind the defenders and create scoring opportunities. The Benfica players didn't have the energy to push forward anymore, they were more interested in defending and clearing the lines in any direction they could. The only time Benfica looked at adding another goal to the score line was a quick counter attack finalized by Markovic that saw his shot saved by Ederson when he appeared to have everything to put that ball in the back of the net. .In the last 15 minutes of the game Benfica was defending with everybody, and Oblak was a general commending the back line. Rio Ave continued to try to get an equalizer but at this point the heart was speaking louder than the tactical awareness of the players lead by coach Nuno Espirito Santo. Oblak at this point was becoming the difference between a win and a tie. The final whistle came 4 minutes into injury time and it was time for Benfica players, coaches and directors to celebrate something that no other Portuguese team had ever done, win all 3 major domestic trophies in one season. Nico Gaitan was voted the MVP of the match.